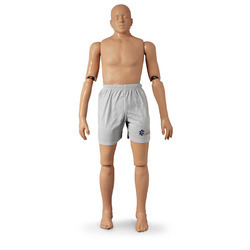 These larger body Rescue Randy manikins come in eight different weights to meet your rescue training needs. Facilitated by our domain knowledge, we are offering Adult Water Rescue Manikins that has wide application areas. Made available at the reasonable prices, our range provides optimum performance at the clients' end. Size: 65" x 23" x 9"
Simulaids has kept all of the training features you prefer and added increased durability and flexibility for improved and varied training exercises. Reinforced joints and the ability for increased mobility are available in the Rugged Rescue Randy. The tear-resistant joints provide the extra durability required for extreme training and the cable system adds strength and increases flexibility. You can extricate Rugged Rescue Randy from vehicles, aircraft, or other restricted areas that previously created great training challenges. Rugged Rescue Randyallows you to train in new places with greater realism and better training outcomes. Rugged Rescue Randy is available at different weights. Developed for lifelike adult or juvenile patient handling, transportation, and extrication training. 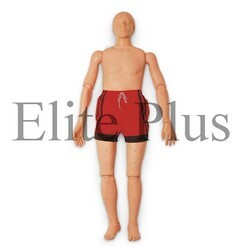 This manikin can be safely used in situations too hazardous or uncomfortable for human volunteers. Made of tough cast vinyl with zinc-plated steel frame for longevity and rugged use. Manikin is fully articulated for positioning in widely diversified training environments. The manikin can be seated in an automobile, positioned in a smoke-filled room, and immobilized on a stretcher for mountain rescue instruction. Useful for simulating the removal of victims from utility poles, conduits, mine cave-ins, tunnels, and limitless other training procedures. Perfect to use with the Manikin Moulage Kit (SB23528U) for casualty simulation. Randy is 5 ft. 5" tall and weighted to 105 pounds with a mixture of vinyl beads and foam to duplicate the weight and resiliency of a human body. Shipped in sweat pants. Fabric U.S.A. Three-year warranty. Developed for lifelike adult or juvenile patient handling, transportation, and extrication training. 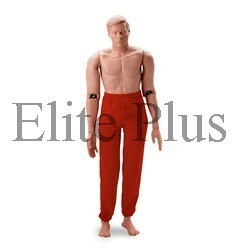 This manikin can be safely used in situations too hazardous or uncomfortable for human volunteers. Made of tough cast vinyl with zinc-plated steel frame for longevity and rugged use. Manikin is fully articulated for positioning in widely diversified training environments. The manikin can be seated in an automobile, positioned in a smoke-filled room, and immobilized on a stretcher for mountain rescue instruction. Useful for simulating the removal of victims from utility poles, conduits, mine cave-ins, tunnels, and limitless other training procedures. Perfect to use with the Manikin Moulage Kit (SB23528U) for casualty simulation. Named the official manikin of the Firefighter Combat Challenge, this manikin duplicates the weight and resiliency of a human body.